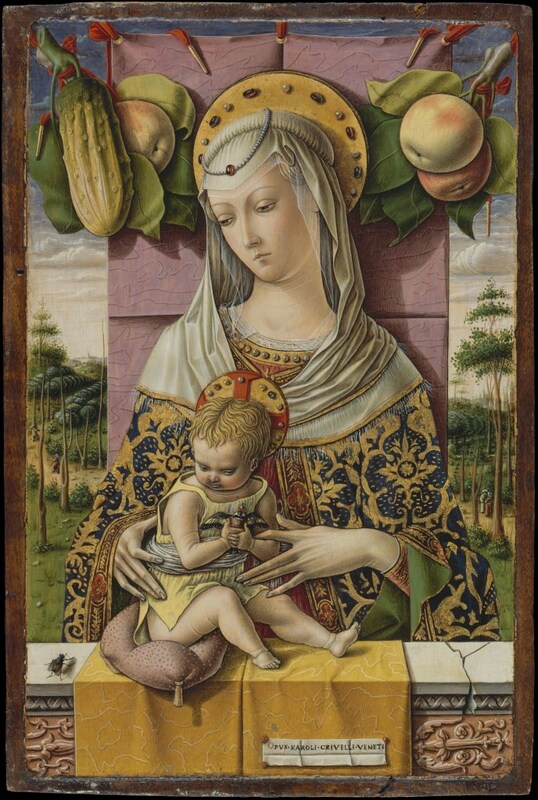 There’s a small panel amongst Crivelli’s paintings in the National Gallery, roughly a foot tall. It shows St Catherine standing in an architectural niche, her right foot poking over the ledge she’s standing on as if into the air of the gallery. But what’s most interesting about this painting is not the martyr’s stance, her attributes of palm and wheel, or the rich folds of her gown. It’s a fly which has apparently lighted on the wall on the far left of the painting. The longer you look at it, the less clear it becomes whether the fly is supposed to be on the wall or on the surface of the painting itself. If it was in the painting, it would be truly monstrous: roughly the size of Catherine’s outstretched middle finger. And doesn’t the fly’s shadow seem to block the light coming from over your shoulder, rather than from the far left as in the painting itself? This isn’t the only fly in Crivelli’s paintings. There’s a Madonna and Child in the Metropolitan featuring an even more ambiguous bluebottle. 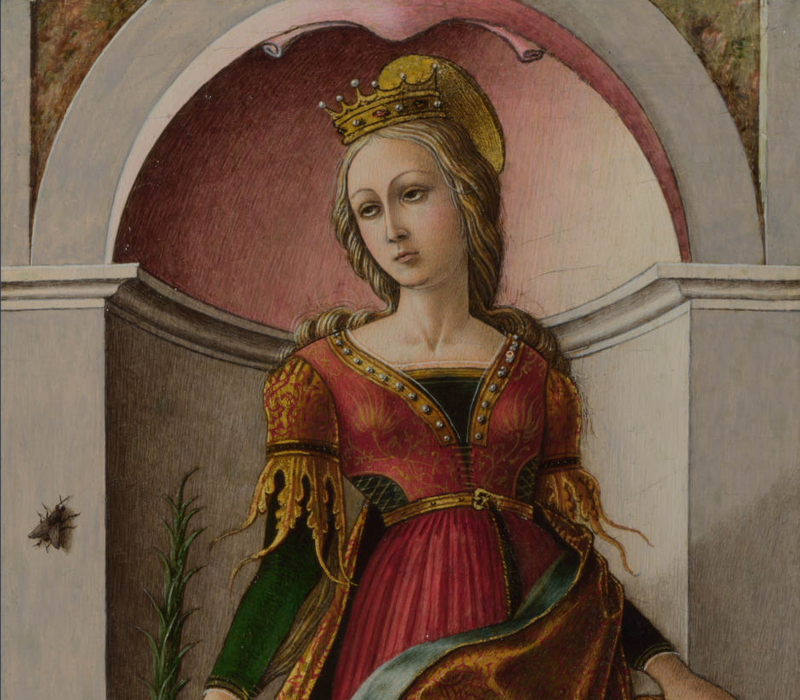 It’s perched on a stone ledge in the very foreground of the painting – a block that might almost seem like another scrap of architecture located outside the plane of the painting, were it not, as in many of Crivelli’s works, part of a series of dizzyingly interlaced layers of space. In the background, for example, we have a naturalistic, perspectival view of a forest scene, blocked by a hanging bolt of mauve material hung from red cords with no obvious means of support within the painting. Yet the Madonna and child are set in front of this curtain, sandwiched between it and the ledge on which both Christ and the fly are sitting. Both figures seem to be looking suspiciously at the fly, once again setting up a tremor of confusion us as to whether it belongs properly in the scene or beyond it. Yet another tremor is set up by the cartellino, the trompe-l’oeil scrap of paper marked ‘Opus Karoli Crivelli Veneti’ which is apparently stuck with drops of sealing wax to a gold cloth hanging over the ledge. Or is it stuck to the surface of the painting? Like the fly, it’s not impossible that it’s part of the interior of the painting – but if that’s the case, how did the painter (who after all is in ‘our’ world and not the world of the painting) place it there? Norman Land has commented on the way these painted flies resonate with others in the narratives of art history: Vasari tells us that Giotto painted a fly on one of Cimabue’s sculptures that was so lifelike that the sculptor tried to brush it away. A similar story is told by Filarete. In both of these anecdotes, what’s fascinating is the attitude of the body that the noisy creature produces; the presence of its mere representation is enough to engender flicking, brushing and swatting in the exasperated viewer. Land reads a religious symbolism out of the fly in Crivelli’s painting, reminding us that the devil is the “lord of the flies” and that by gesturing at the fly we “participate in the painting and commune with it by rejecting the arch deceiver, Satan, in the form of the fly, which, in turn, has deceived our eyes”. But this bodily engagement with the noisy (and noisome) object or creature isn’t tied to a purely devotional response. Imagine: the heavy, stupid buzz of a bluebottle suddenly stops. As you look for it, your relief at the silence is mixed with exasperation at its refusal to find the open window. You spot it squatting on a sunned postcard tacked to the kitchen cupboard, rubbing its hands: revolting. Should you swat at it? If you do, you’ll face the prospect of more buzzing, more dense taps as it hits the glass, and then when the noise finally stops you’ll be compelled to look for it again. But if you don’t do anything it’s going to carry on crawling, like it is now, up the side of the face of the unknown man whose portrait so struck you in a museum in Lisbon. You’re in a relationship with this fly; a relationship of annoyance and mild disgust, but a relationship nonetheless. “Living apparatus” is such a suggestive phrase. It suggests actions occurring as a consequence of subcutaneous processes passing unnoticed by conscious thought; it suggests the way the painted image of a fly primes the viewer to unruly action; it conjures complexes of people, animals, objects and scenarios working in meshed relations. (As an aside, it also seems an excellent way to imagine the complex of performer, text and audience in a poetry reading.) Somewhat more obscurely, it evokes for me Raymond Williams’ idea – explored in Marxism and Literature and elsewhere – that there exist ‘structures of feeling’ which he called “social experiences in solution”, still to be precipitated out (with attendant loss) into the crystalline forms of novels, paintings, poems. The noisy insect – in the painting and, quietly obscene, on the painting – the way it tips the reader of the painting towards the swat, the flick – reactivating a state of uneasy rest into a buzzing, circulating noise – this sense of a complex existing around and with and somehow counter to the solidity of the painting as a cultural form – all this seems to gesture towards the “living presence”, the un-articulate fullness of social life and its conflicts that Williams glimpses in his peripheral vision, hovering “at the very edge of semantic availability”. *See also Lisa Blackman’s 2014 article ‘Affect and automaticity: Towards an analytics of experimentation’, Subjectivity, 7:4, 362-384. This entry was posted in Some Scores (A Blog) and tagged Carlo Crivelli, fly, Gesture, living apparatus, painting, Raymond Williams, Vinciane Despret on May 6, 2015 by admin.